The POP (point of purchase) display is available to you KD (knocked down or folded) or filled. It holds 36 pieces and makes a very colorful eye-catching presentation. You only have a few moments to get your customer interested in your product and this is a good way to do it. Introduce your product to the marketplace and, when the product sells down it will be returned to the planogram. The design and specifications for this display are available to you if you want to have it made locally. We can create other floor displays for you using any of the products that we sell. 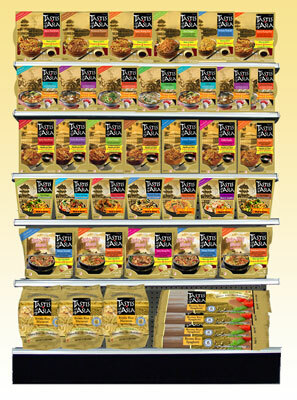 TASTES OF ASIA can create a wonderful "End Cap" or "In-Line" planogram for you using our state of the art planogram formats. Whether you want two, three or more shelves and whether or not you want a 3' X 6', 4' X 6' TASTES OF ASIA shows off its' product that makes your customer want to buy. The planogram shown is 4' X 6'. We make only the highest quality noodle, rice pasta, konjac and other food products. Experience the authentically Asian and all natural Tastes of Asia!